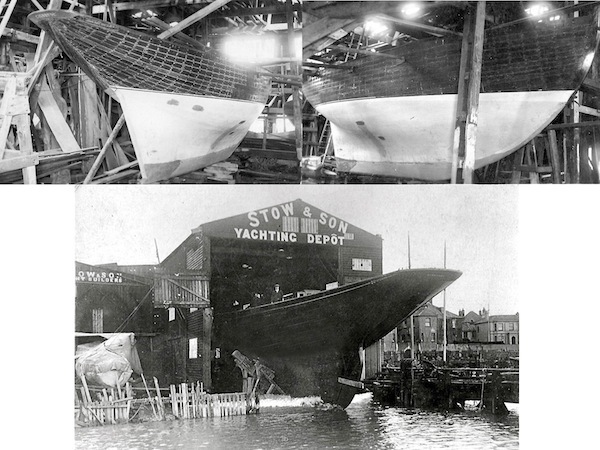 During the late 19th and early 20th centuries Thomas Stow & Son earned themselves a reputation internationally as a respected designer and builder of good quality luxury racing yachts and other types of boat at their shipyard on the river at Shoreham. In his book ‘The Ships and Mariners of Shoreham historian Henry Cheal lists some of their schooners, yawls, luggers and cutters. These were of high quality, well planned internally to give them a ‘roominess’ rarely matched by other makers. Besides supplying private customers Stows also built many of the boats that carried British troops up the river Nile for the 1884 Sudan Expedition. The Stows originally came to Shoreham from Littlehampton during the first half of the 19th century when John Stow, a boat builder, moved at first in to the High Street then later to the modest Viaduct Cottages that were tucked into the narrow strip between the railway tracks where the Steyning line branches off from the main line. His eldest son Thomas was born at New Shoreham in 1828 and followed his father into the trade. By the late 1860’s Thomas had moved his own family to New Road, backing on to and immediately opposite the shipyard (now the Sussex Yacht Club) that they had acquired and then extended from the Dolphin Hard (where the footbridge is now) to the Surry Hard. It is around this time that Stows started making more of a name for themselves. Thomas’ first son Harry was one of eight siblings and although most of the sons joined their father in the business it was Harry as the eldest who was to inherit the business and, like his father, create their vessels’ successful designs. 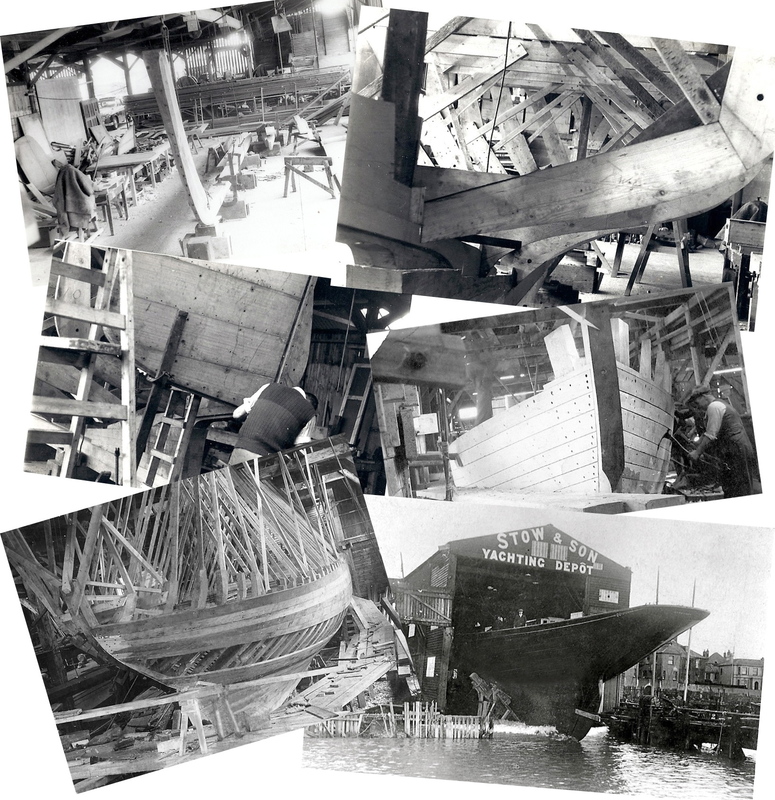 The shipyard was soon partially covered by a huge, ugly, black-tarred shed to enable uninterrupted construction whatever the weather, a facility considered essential by Lloyds in the building of quality yachts and one that warranted particular mention in their registers (from which the information in these listings are taken). Although the English family in Shoreham had ceased their rope-making a few of them were still making sails at that time but mainly for Courtney & Birkett at Southwick. Stows did not seem to use them much at all, preferring as they did Ratsey and Lapthorn, the internationally recognised (and still are) sail-makers at Cowes on the Isle of Wight. The cabins within the larger yachts were constructed with teak, mahogany and oak then highly polished to provide a stunning vision of quality. Externally, the sleek lines of their racing yachts soon became very well known and attracted buyers from all over the world. 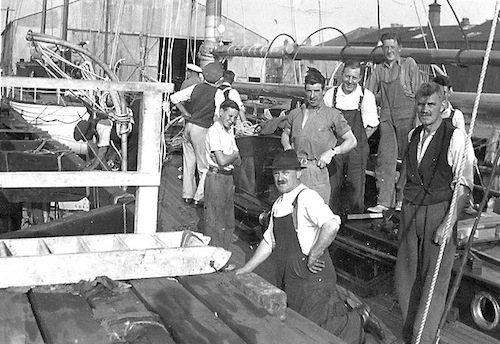 The Stows were successful enough with their own designs but were never too proud to build craft designed by others including the famous yacht designers Albert Strange, Fred Shepherd, Linton Hope and Dixon Kemp. The larger racing yachts were certainly their forte but they also built smaller sailing craft and even a few screw-propelled vessels. Production increased steadily over the years since the 1860’s almost certainly peaking in the 1880’s but for the fact that the figures shown here do not include the vessels constructed for the Sudan Expedition. What is surprising though is the large drop in production during the last few decades, a fact that isn’t remarked upon in records of the time. The late 1920’s and the 1930’s were of course the years of the Depression that may provide some of the answer except that the fall in the number of new vessels seems to have started some time before. 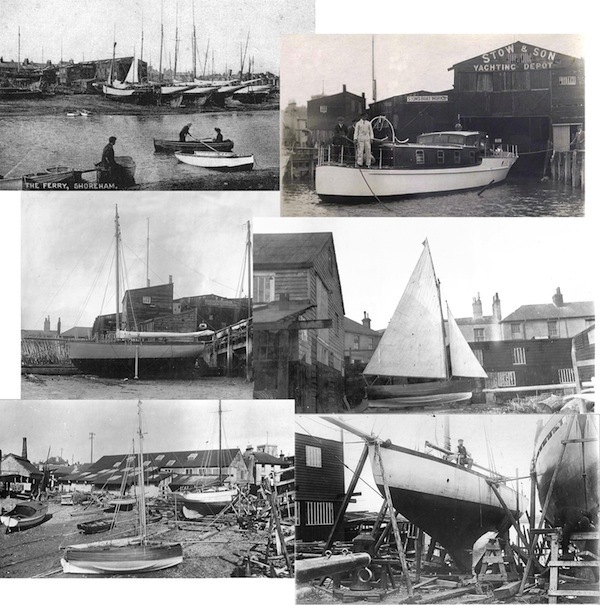 No doubt though there was plenty of work carried out in the repair and updating of older craft and the building of much smaller dinghies and boats that the firm also made but were not recorded. The Stows didn’t seem be a particularly wealthy family perhaps partly due to the fact that, despite their quality, their yachts were never over-priced (see ‘Voluta’ and George MacAndrew’s reasons for purchasing Stow built yachts) – no doubt a major reason for the continuous flow of orders during the boom years. At least a dozen Stow-built yachts are still sailing, some are over 130 years old, and some fetch prices now of over £1.5 million each. The business was purchased by Lady Bee Ltd after Thomas Stow’s death in 1936 and moved downstream away from the town. Alan Upton’s delightful reminiscences of the Stow family business and the people that worked there can be seen in the Shoreham Herald ‘Bygones’ articles BY12, BY21, BY22 and BY53 on the Shorehambysea.com website. The following does not pretend to include all the vessels that Stow & Sons have built but as far as is known this is the first time that a list of a significant number of their yachts (over 80 of them plus a dozen or so Courtney & Birkett and Suter yachts) have been identified and put together. It was interesting to note that, although changing vessel’s names may have been considered by sailors to be bad luck, many were changed, usually when purchased by new owners and in one instance (the ‘Yolande’) no less than seven times. Aside from the very smallest dinghies and boats that Stow made (but were not recorded) the smallest craft in the registers is the ‘Violet’ of 2 tons and 18 feet in length. This compares with the largest known ‘Lavengro’ that with its 134 tons and 89 feet length was almost of ship-like proportions. Details from the Lloyds Yacht Registers have been supplemented with information and photographs of surviving vessels gleaned from the internet and from current day owners and yards that have contacted us. We are of course always happy to hear from others who know of any other Stow yachts that may still survive. Not every piece of information in the registers has been included as this is more an historical record rather than a technical one. Nevertheless, engine specifications where fitted were considered an interesting addition as were linear ratings when given by the various yachting associations (but not an explanation of how they were calculated) which enabled handicaps to be imposed to even out size etc., advantages when racing. Similarly, where the standard method of measuring vessels’ dimensions are not included they are sometimes confusingly shown as ‘Thames Measurements’ which are again associated with handicapping (as well as a means of estimating harbour dues) but do result in marginally different figures to the standard ones. The dimensions (L=length, b=breadth, d=depth) are in feet (they have been checked against dimensions of surviving vessels) although it is difficult to appreciate some of the measurements where the figures to two decimal places go beyond 12 inches? Vessels’ names are shown as they were at the time of the register record (i.e., 1903 and 1936) but earlier ‘ex’ names are also shown. Some were also given the name of a previous yacht so be aware of dimensions and build year to avoid confusion. (ex Bo Peep) 1868 Yawl, wood (construction). 17.37 tons. L 46, b 12.5, d 8. Replacement sails made by Pannell & Hibbs 1893. (ex Phyllis) 1883 Yawl, wood. 21.24 tons, L 49.3, b 11.7, d 8.7. Replacement sails by Macmillan 1899. Owner Duncan MacCallum – home port Campbeltown. Arvon 1884 Cutter, wood. 5.10 tons, L 25.8, b 8.7, d 6.1. Replacement sails by Hoopel 1899.Owner Thomas Goode – home port London. (Brada continued) 1901 Yawl, constructed of seasoned wood 12 & 16 years old. 23.33 tons, L 61, b 13.9, d 9.17. Sails by Lapthorn & Ratseys 1901. Yacht built under a permanent and water-tight roof. Anchors and chain cables proved at survey in Shoreham. Owner Sir William Orr Ewing, Bart – home port Shoreham. (ex Fair Wind) 1896 Auxiliary Yawl,wood. 15.96 tons, L 52.7, b 12.2, d 8.7. Sails by Ratsey 1925. No details of motor. Owner Louis A. Hart – home port Shoreham. In fact Cygnette was never fully completed and was subsequently deleted by Lloyds from their registers as never having existed. The Lady Bee firm resuscitated and remodelled the unfinished project and relaunched her as the ‘Joya’ a brand new vessel (without an ex-name). Desire 1912 Auxiliary Cutter, wood. 2.72 tons, L 25.7, b 8.25, d 5.6. 2 cylinder paraffin motor 3.5” – 4.75” side ppr by Bergius, Gls. Owner A.J. Lawrence – home port Shoreham. Still sailing and last known (2010) when part of a yacht chartering fleet in the Caribbean. 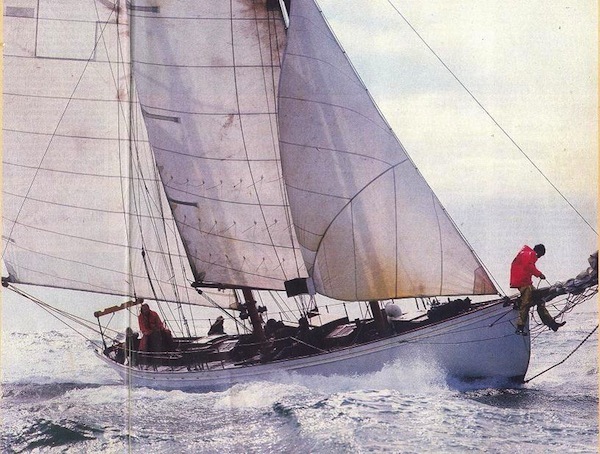 The vessel is described as “… a Marconi-rigged Ketch with a 100 hp marine diesel…. 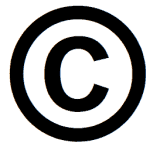 A ‘double-ender’ of the type particularly favoured by the designer Fred Shepherd…… sleeps six. Imatra 1899 Auxiliary Yawl, wood 12 & 16 years seasoned. 24.21 tons, L 61.8, b 13.2, d 8.8. Sails by Ratsey 1930. Electric lighting. Yacht built under a permanent and water-tight roof. Paraffin motor 2 cylinder 5.5” – 7’ by Bergius, Gls 1921. Owner Mrs. M.C. MacKenzie – home port Portsmouth. Lavengro 1902 Ketch, wood. 134 tons, L 89, b 19, d 11 (all Thames Measurements). Sails by Ratsey & Longthorn 1902, sail area 6,136. Owner Gervase Beckett – home port Shoreham. Mabel 1893 Yawl, wood. 11.95 tons, L 38, b 10, d 7.2. Replacement sails by Lapthorn & Ratsey. Linear rating 40.88. Owner F. Baird Smith – homeport Shoreham. Morwenna 1914 Auxiliary Schooner, wood 12 & 16 years seasoned. 10.44 tons, L 48.2, b 12.1, d 7.5. Sails by Ratsey 1926. Electric Lighting. Yacht built under a permanent and water-tight roof. Paraffin motor 4 cylinder 4.25” – 5” by Gleniffer of Gloucester. Owner Lt – Col. R.E. Sanders, D.S.O., O.B.E., – home port Shoreham. 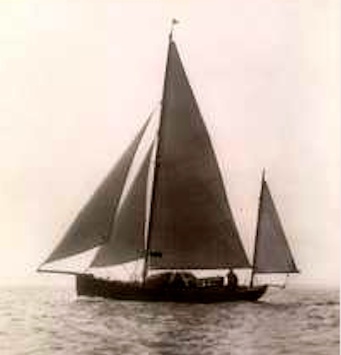 Morwenna took part in the 1927 Fastnet Race. Red Dragon (continued) 1892 Sloop, wood. 3.92 tons, L 27.1, b 7.5, d 4.2. Replacement sails by Thomas 1898. Owner John Maude – home port Shoreham. 1934 Yawl, wood. 16.18 tons, L 61.8, b 13, d 9.4. Replacement sails by Lapthorne & Ratseys 1899. Yacht built under a permanent and water-tight roof. Anchors and chain cables proved at survey in Shoreham. Owner Charles C. Craig – home port Shoreham. (ex Hildegarde, ex Dorade) 1900 Schooner, auxiliary surface condensing (engine), wood. 22.81 tons, L 63.55, b 13.3, d 9.13. Sails by Madder 1900. Simpson, Strickland & Co of Dartmouth engine four cylinders 3.75”, 5”, 6.75” & 9” – 5” with 1 water tube boiler producing 2 nominal horse power. Owner T.H. Sanderson – home port Shoreham. Sula 1879 Yawl, wood. 54.19 tons, L 74.5, b 16, d 10.7. 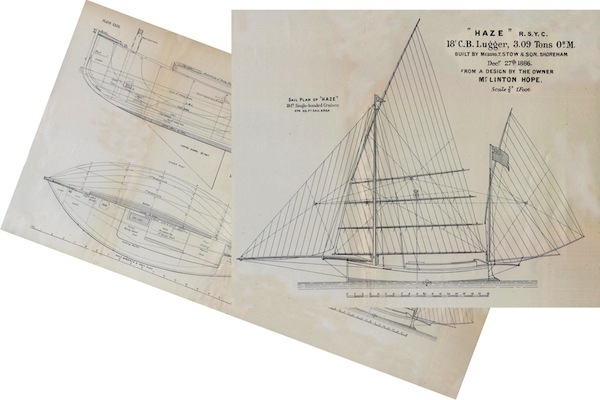 Replacement sails by Ratseys & Lapthorn 1897. Owner Lord Churston – home port Shoreham. (Originally built (1879) for Baron T. Erskine. (sister ship to Rosalind) 1904 Auxiliary Ketch altered from a yawl (no year given), wood 12 & 16 years seasoned. 34.20 tons, L 69, b 14.65, d 8.7. Sails by Ratsey 1931. Electric lighting. Wireless. Yacht built under a permanent and water-tight roof. Petrol motor 4 cylinder 3.75” – 5” side propeller by Thornycroft 1930. Owner Wm. C. Perkins – home port Shoreham. Thistle See details for ‘Rubi’ . Valerie (continued) 1895 Yawl, wood. 6.94 tons, L 39.6, b 10.2, d 6.4. Sail maker information missing. Owner Charles H. Brampton – home port Dublin. Varani 1889 Cutter, wood. 13.43 tons, L 45.3, b 10.5, d 8.15. Replacement sails by Lapthorn & Ratseys in 1893 & 1897. Owner J. Knight-Revel – home port Shoreham. Voluta 1900 Yawl, wood. 10.5 tons, L 39.3, b 11.4, d 6.2. Sails by Ratseys & Lapthorn 1900. 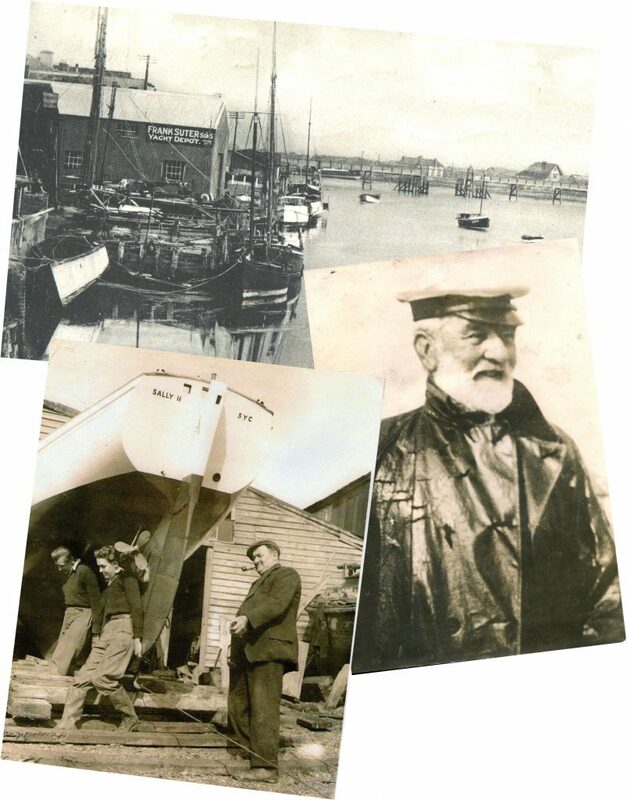 Owner George MacAndrew – home port Shoreham. George MacAndrew of the large shipping line, after he had been well satisfied by a previous boat they had built for him, the ‘Ianthina’. His notebook details the reasons he chose Stows over Paynes of Southampton and Lukes of Hamble, namely lower cost for the same quality. MacAndrew cruised the Solent and West Country in the next two seasons, sailing with his family from a base at Seaview on the Isle of Wight, and wintering her at the Hamble. In 1904 she was sold to Dr Jackson, the Commodore of the Royal Yorkshire Yacht Club where she remained for the next 40 years or so. White Kitten 1899 Yawl, wood. 4.61 tons, L 31.6, b 9, d 6.15. Sails by Madder 1899, sail area 885. Owner W.I. Beaumont – home port Shoreham. 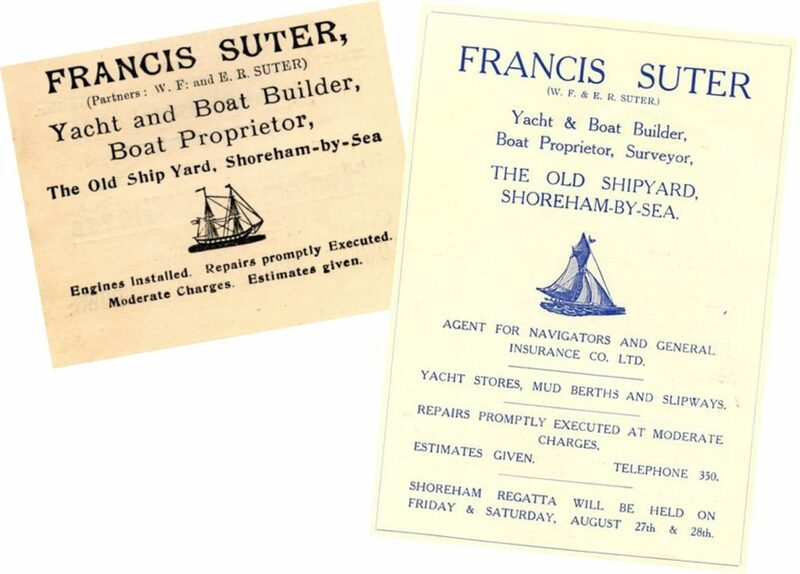 Francis Suter, the son of a shipwright, is thought to have purchased the Old Shipyard during the 1880’s fromDyer & Sons, the shipbuilding family the Suters once worked for. The yard in those days extended from the High Street to the riverside and in length from opposite Ship Street up to the Bridge Inn. Top – The yard. Right – Francis Suter. Left – Reg Suter. 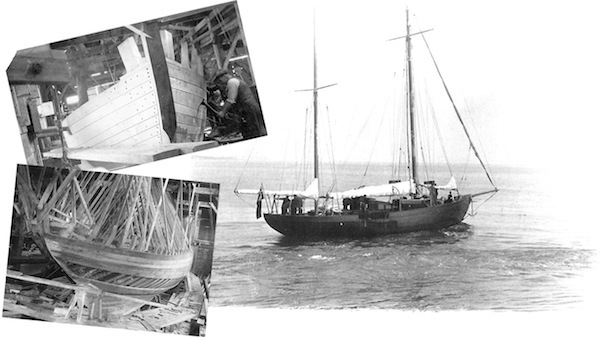 Francis made his name building and repairing smaller yachts although some were up to around 50 feet in length. He was a keen yachtsman himself winning many cups and prizes at regattas in and around Sussex and was reputed to have saved twenty lives from drowning. He lived with his family at May Cottage next to the Norfolk Suspension Bridge before moving in later years to the bungalow that still stands at the junction between Victoria Road and Old Shoreham Road. The business passed to sons Reginald and William when Francis died in 1928 at the age of 80 then eventually ceased altogether in 1963 when the land was sold for development. There were many yachts built by the Suters over the years but sadly any records of them were destroyed with the accounts books and ledgers in 1963. We now only know of two of their craft, the records for which havesurvived only because they were included in the Lloyds Yachting Register of 1902 – perhaps others may eventually come to light. (ex Maude, ex Falcon) 1892 Yawl, wood. 14 tons, L 38.1, b 9.6, d 6.2 (Thames Measurement). No sailmaker shown. Owner Ange Desormeaux – home port Brest. 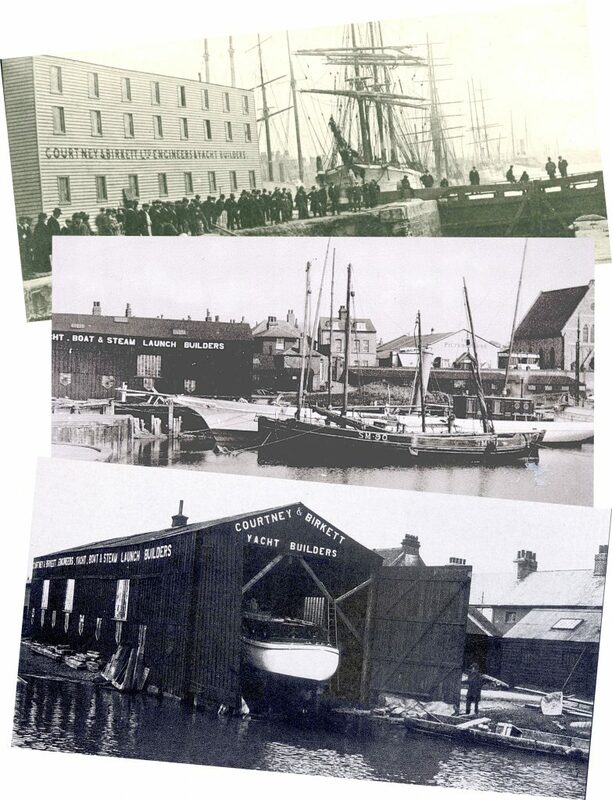 Courtney & Birkett took over the old Shuttleworth shipyard alongside the harbour locks at Southwick and built their first yachts there in 1887. Having previously been used for the construction of large ships the shed there was of a considerable size and eventually the firm moved to another shed alongside more suited to the smaller yachts they produced. As with the Stow yacht details the following are not all the craft that Courtney Birkett built but it is probably the most complete listing to date. The business was later purchased by the Lady Bee Ltd that had also bought up the Stow & Son business and merged the two at the Southwick yard. Top – The large shed at the old Shuttleworth Yard. Centre & Below – The yard and later shed. Bonita 1893 Cutter, wood. 2 tons, L 16.3, b 5.5, d 1.7, Replacement sails by English 1897, sail area 275. Rating 0.75. Owner A.A. Watkins – home port Woodbridge. Eaglet 1887 Screw Schooner, wood. 15.89 tons, L 70, b 11.5 d 8. Sails by Ratsey & Lapthorn 1889. Built with 9 & 16 year seasoned wood under a permanent, watertight roof. Engine 2 cylinder 8” x 16-12” 7 nominal hp by G. Courtney of Southwick. Owner Geo. F. North 1903 – home port Shoreham. Yawl, wood. 18 tons, L 38.5, b 11, d 6. Sails by English 1902, sail area 950. Information on owner and home port missing. Designer Linton Hope & Co.
Nanette 1901 Cutter, wood.16 tons, L 40.5, b 10.1, d 6.42. Sails by English, sail area 1300. Owner W.O. Turnbull – home port Whitby. Courtney & Birkett Builder, Linton Hope Designer. Zelia 1903 Auxiliary Gaff Sloop. 6 tons, L28, b7.75, d 5.4. 2.25” x 3.5” by Ailsa Craig 1947. Owner J. F.
Lloyds Yacht Registers 1902/3, 1935/36 and other information (Eudroma and Joya) kindly provided by Lloyd’s Register Group Services Ltd.